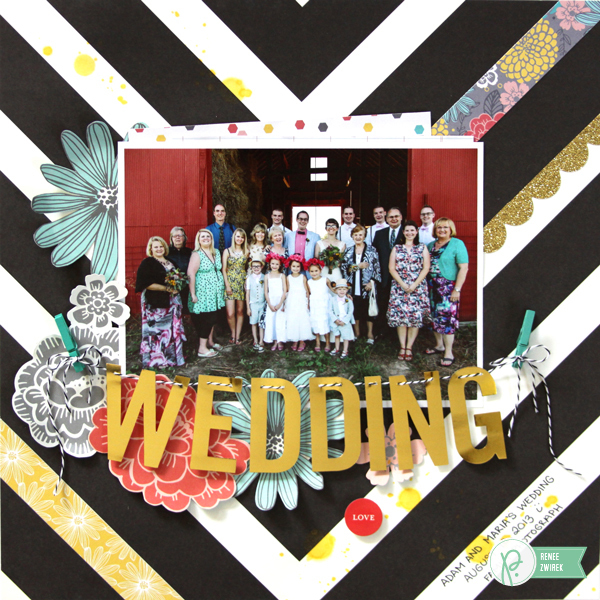 September 2014 - Pebbles, Inc.
Hi, it’s Renee Zwirek here today to share with you how I used Mini Clothespins on this wedding layout I created with the lovely Home+Made collection. 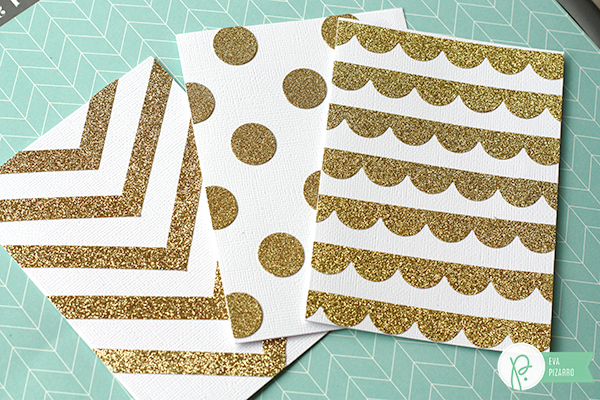 I started with these fabulous Large Gold Alphas. I made sure I added some adhesive foam dots to them first so that they wouldn’t stick to my working surface. 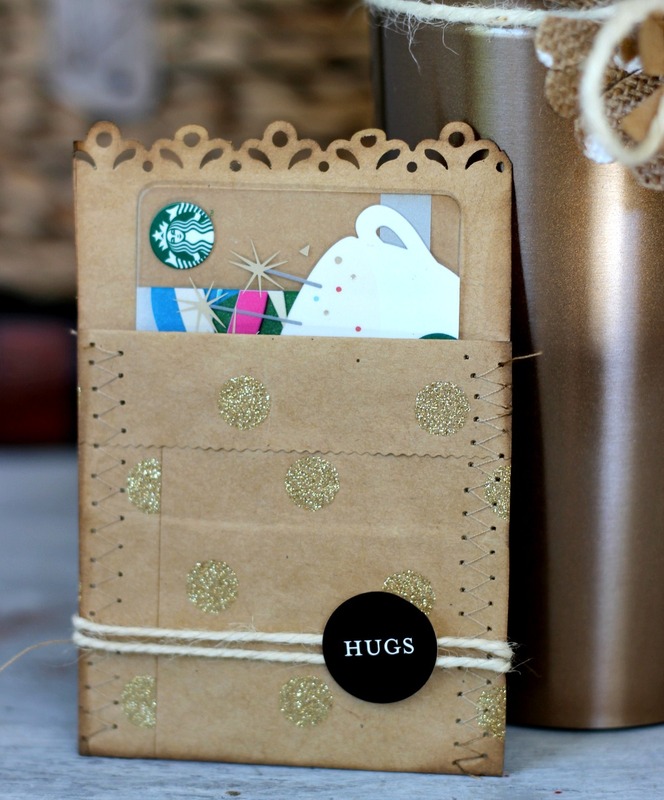 Then, I used a sewing needle to poke tiny holes along the tops of each letter. 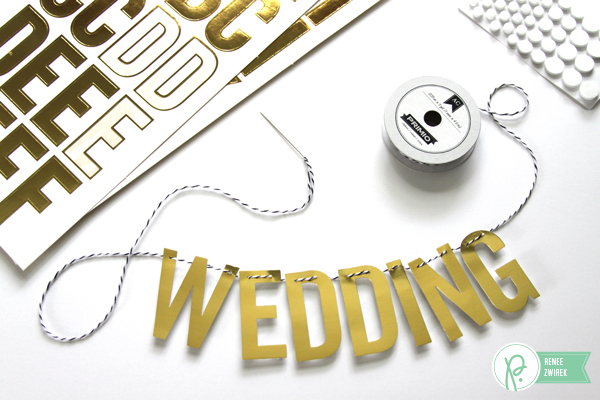 Using the same sewing needle, I threaded the black and white baker’s twine through the letters and made sure I spaced them out the way I wanted for my layout. 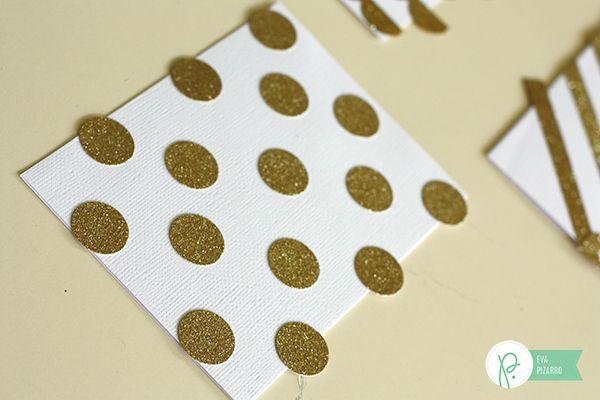 I added some extra adhesive foam dots where I thought I would need them to make sure the gold of the letters would look nice and smooth. 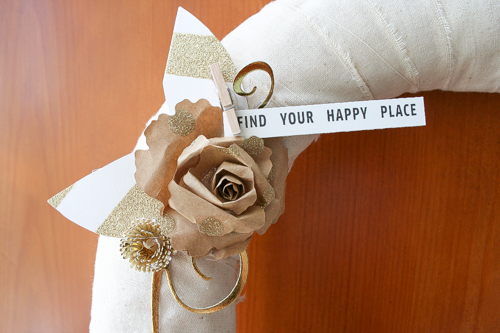 I placed my title where I wanted it and added the mini clothespins to the twine. 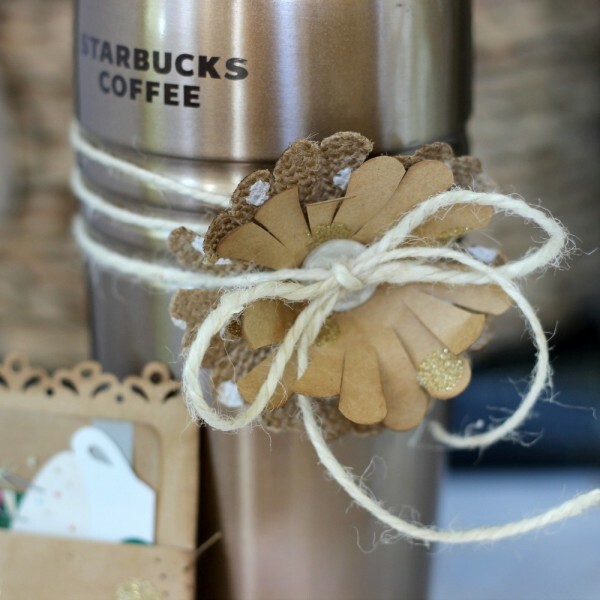 I finished off my mini clothespins by tying some bows to them. Here’s the finished layout. I love this family photo (taken by Casey Broadwater) at my brother-in-law’s wedding! I made the photo 5 x 7 for two reasons. One, it was the perfect size to go with those pretty gold letters of my title (of course, it’s all about the scrapbooking first. Ha!). And, two, I really wanted the photo to be the focal point for my layout. 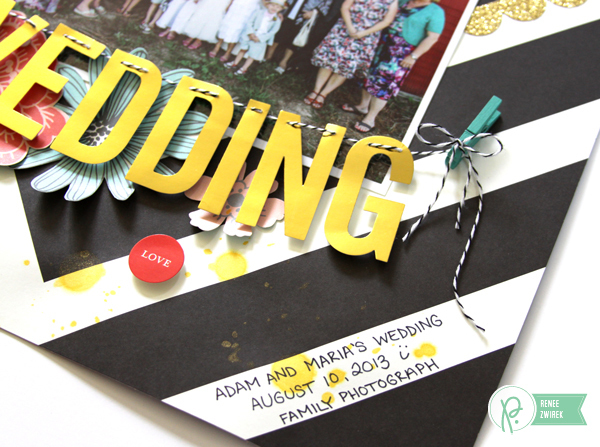 I really love the way this pattern paper draws your eye to the photo and title. Here are some close-up shots of the mini clothespins holding the title. Hello Pebbles fans! 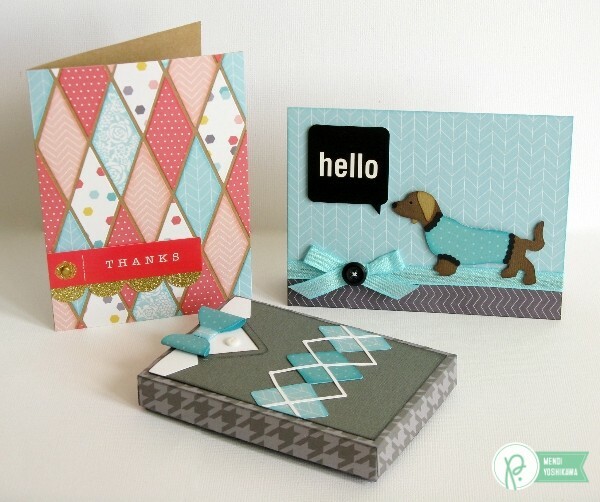 It’s Mendi here today with some cards that center around the theme of sweater weather. I just love all things fall and having an excuse to pull out my cozy sweaters, don’t you? 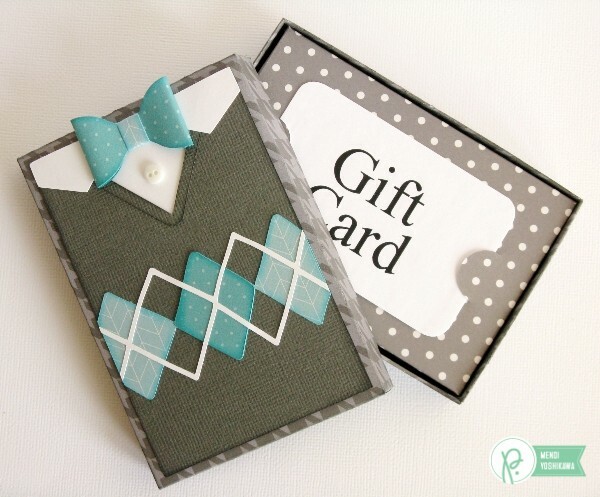 For my first project I have a little sweater vest gift box I created using a variation of THIS cutting file which I paired with a Maggie Holmes darling bow tie die. 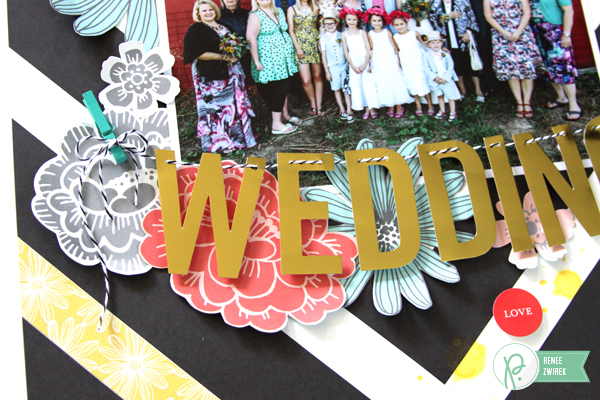 It was the perfect size for this and I think it totally makes the project! The shallow box opens to reveal a gift card. I think this would be fun to give to men who might otherwise be hard to shop for. 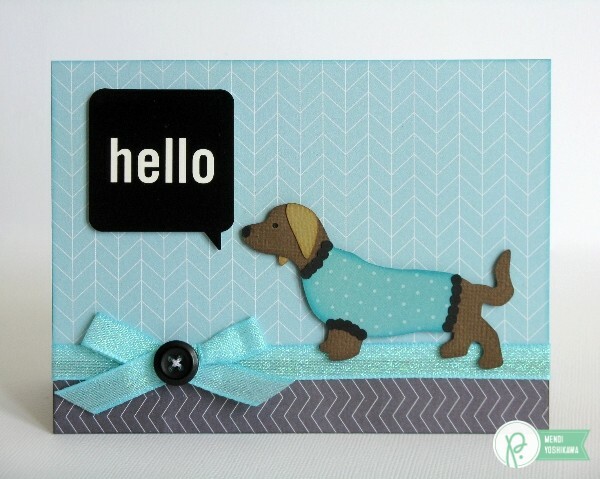 Up next I have a little card featuring a darling dachshund in a dog sweater (from THIS cutting file). Dogs in cute sweaters get me every time. 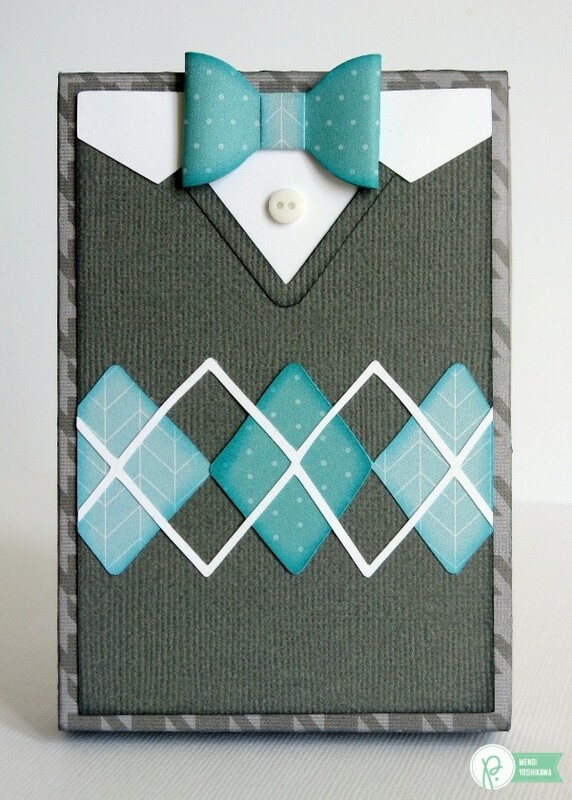 Fall sweaters often make me think of argyle, but what started as an argyle pattern quickly turned into a fun diamond background for my last card. 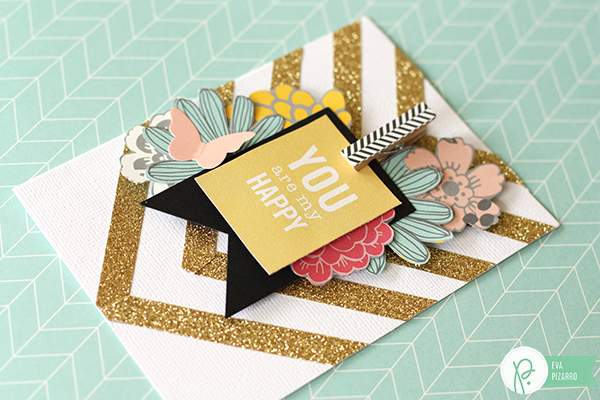 To create this one-of-a-kind background I used this new banner die set by Jen Hadfield. 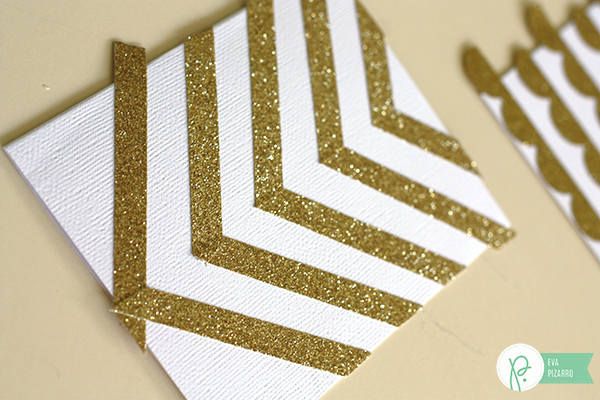 Instead of folding the die cut in half to create double-sided banner pieces, I used them open as elongated diamonds. 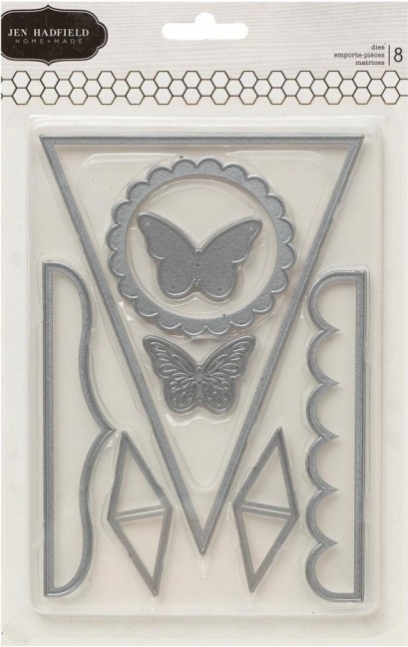 I love that the set comes with two identical dies to speed up the die-cutting process. 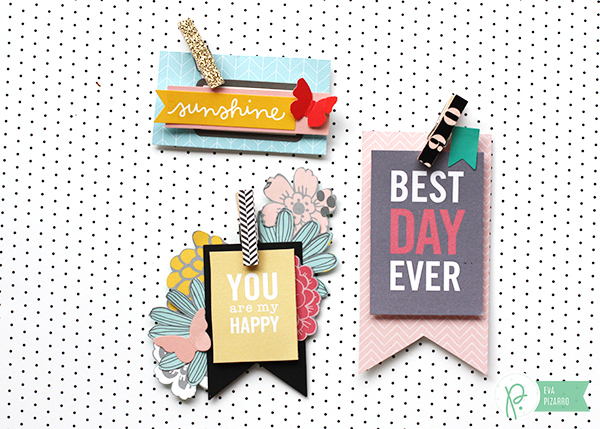 To share how I made this background I created a little picture tutorial. See below for a full description of each step. 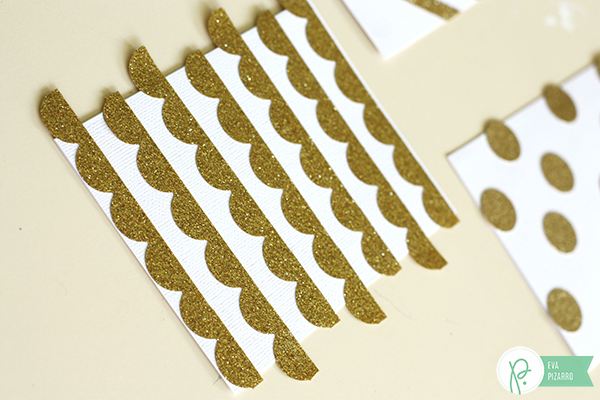 Step 1: Die-cut approximately 22 diamonds from 4 to 6 different patterned papers. 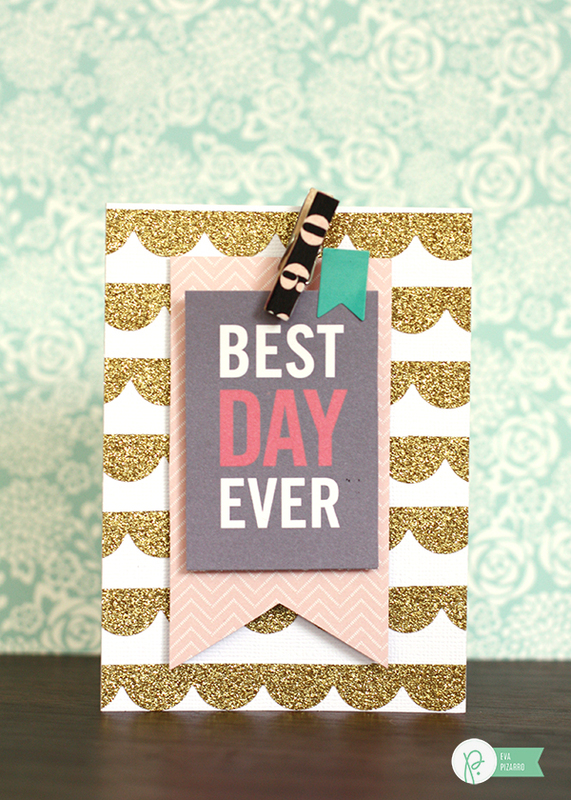 I chose to add chalk ink to the edges to make the diamonds pop against the background, but this step is optional. 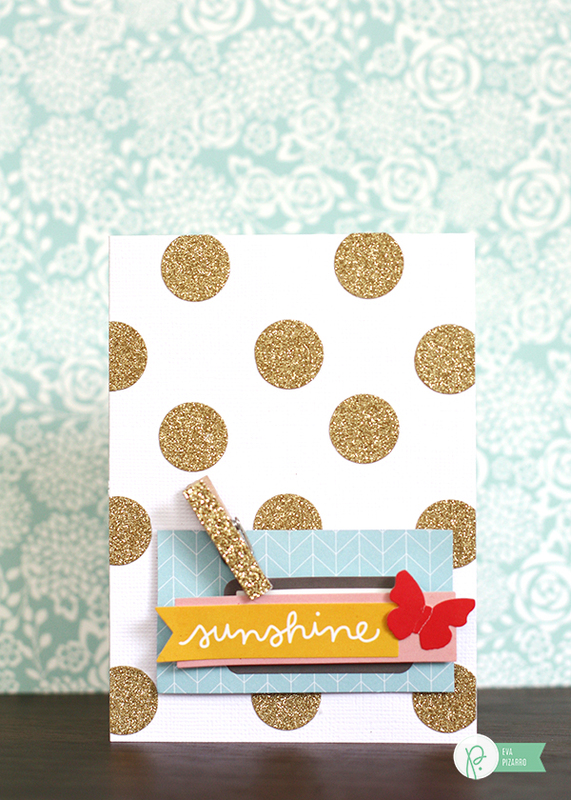 Step 2: Loosely arrange the diamonds on an 4″ x 5.5″ kraft note card to determine pattern. 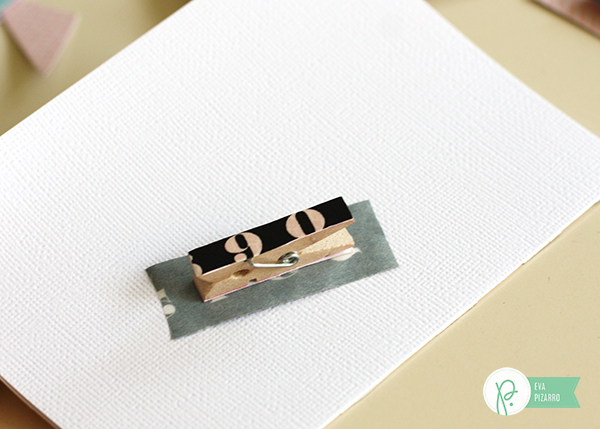 Step 3: With the dies I used I measured that the diamonds would be placed 1″ apart from center tip to tip. 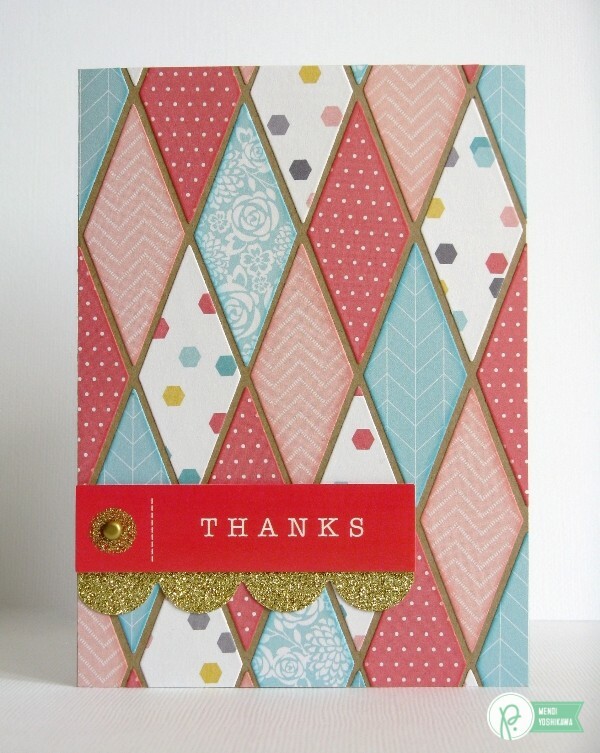 Carefully move diamonds off to the side maintaining your pattern. Step 4: Since my note card was an even 4 inches and I needed them spaced 1″ apart this made calculations easy. Using my pencil and ruler I marked every 1/2 inch at both the top and bottom and then lightly drew a line connecting them. I also determined the middle and drew another perpendicular line. Step 5: Starting from the center adhere your diamonds using the axis to keep your lines straight. I adhered mine with a glue pen. I liked that it could get into the tips easily without a lot of mess. 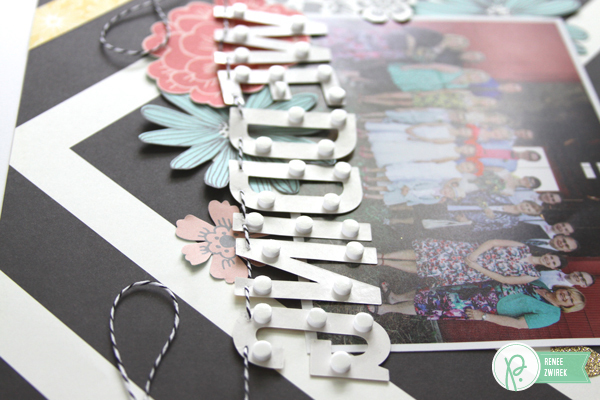 After you have your first row adhered, work outwards leaving a small gap between the diamonds as shown. 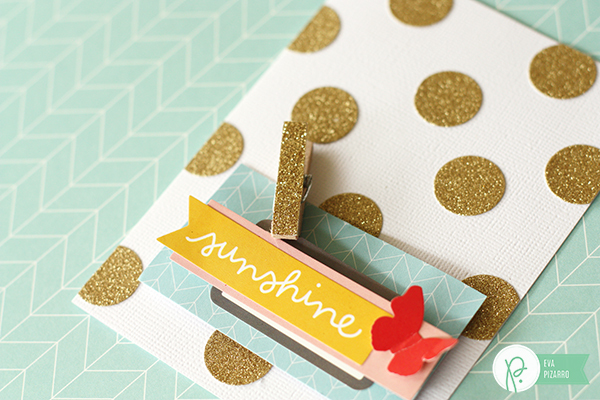 Step 6: After most of the card is covered, flip over and cut off excess overhang with scissors. 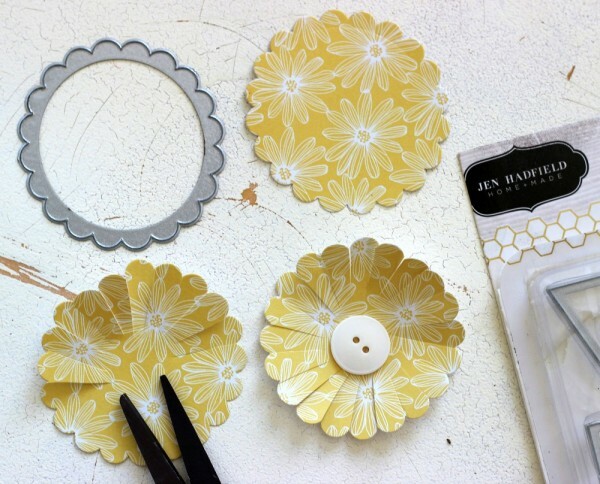 Save these scraps as they will be perfect for filling in the tiny leftover gaps. 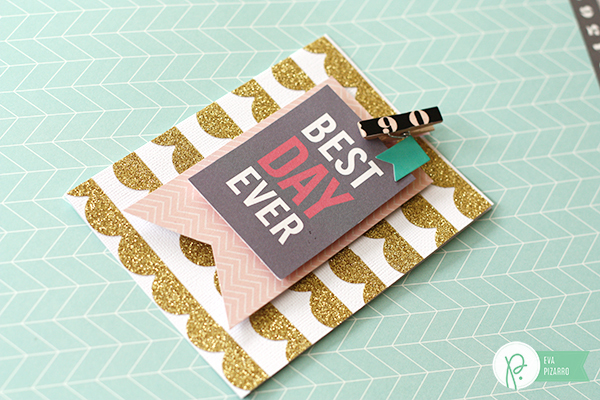 Step 7: When all the gaps have been filled, erase any pencil lines that show between the diamonds and decorate card front as desired. 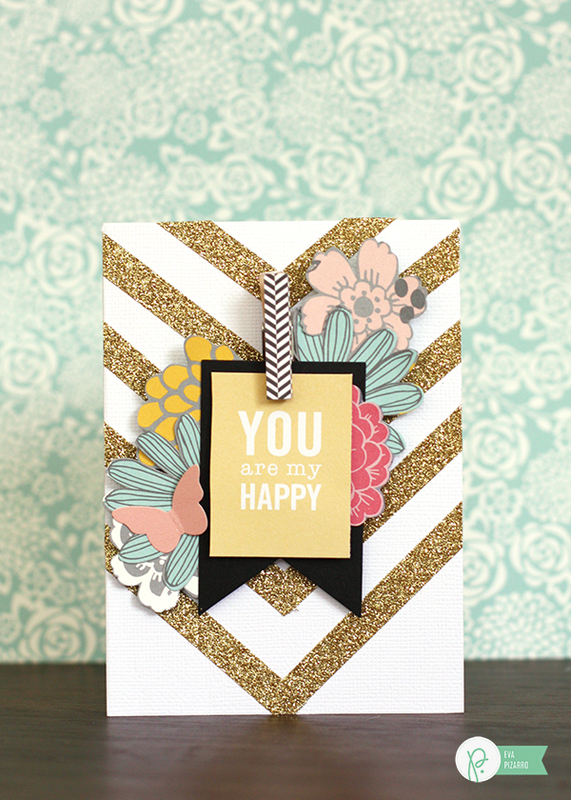 I kept my card simple with a sentiment sticker, brad and some scalloped decorative tape. Hi everyone, Wendy here today. 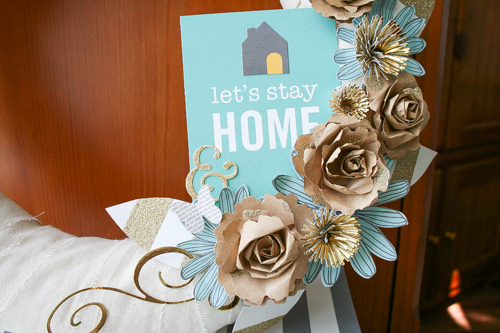 I was thrilled to have the chance to work with the new Home+Made collection, but the topic was Sweater Weather! See we live in Florida, and there is no such thing as sweaters here, lol. 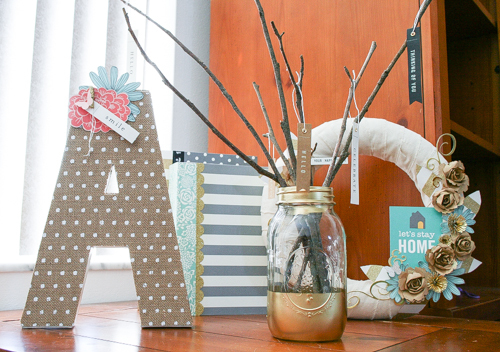 So while I don’t have the traditional pictures some might have, instead I created some Home Decor projects to bring the fall feel into our lives even though the weather doesn’t cooperate. 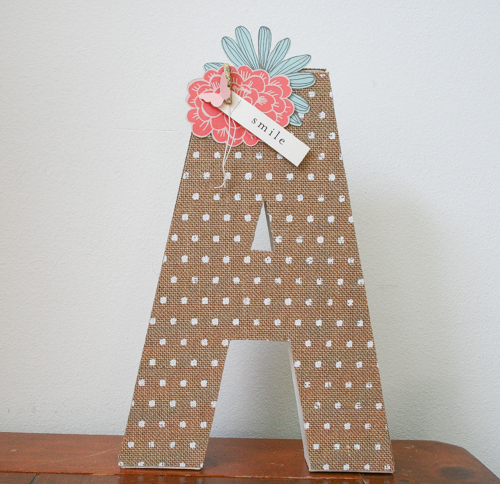 The first project I created was my letter A.
I bought a paper mache letter from my local craft store and covered it with the burlap paper. 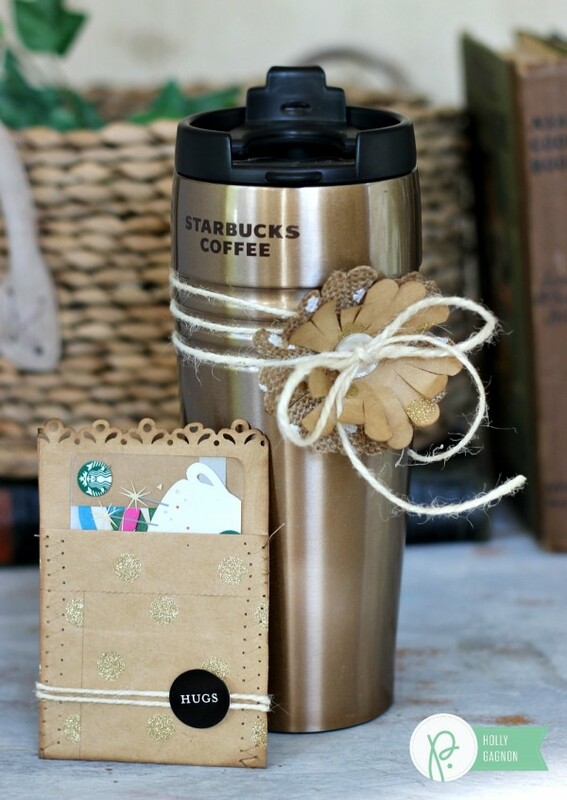 I was amazed how well the burlap paper cut and adhered to my letter with the mod podge. 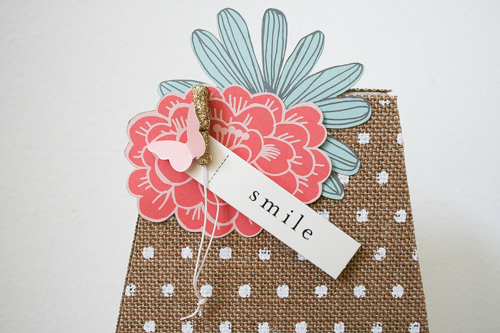 A few fussy cut flowers and a tag were the perfect finishing pieces to my project. My next project was my tree. As easy as it looks this was not the original intent! 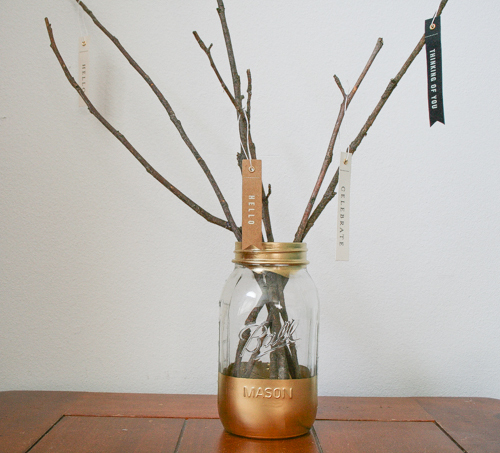 I started by spraying my jar with gold spray paint (and now I am addicted to spraying everything). I then gathered sticks of various lengths. I originally had cut leaves to put on my trees, but they didn’t give me the look I wanted. The tags though were perfect to hang from the branches. I did hot glue the string to the branches so that they wouldn’t go everywhere and would stay where I wanted them. My final project was my wreath and this came together because I had those pretty leaves cut and I wanted to use them for something. 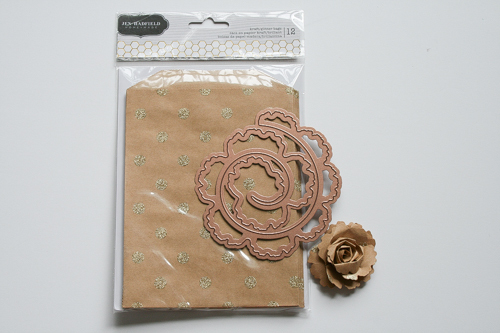 The gold foil paper is thicker but worked well in my dies to cut the fringy flowers. I used my leaves to fill in the areas around my flowers (both made and fussy cut). 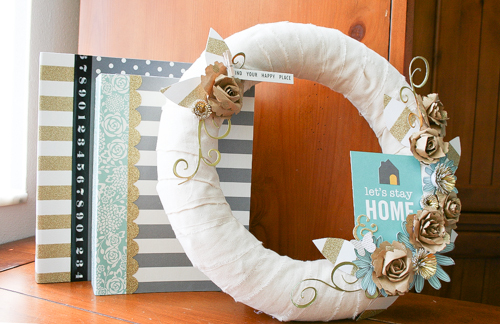 A 3×4 card tucked behind the flowers gave the perfect pop of color and theme to my wreath. My sentiment at the top with another flower was the finishing touch. 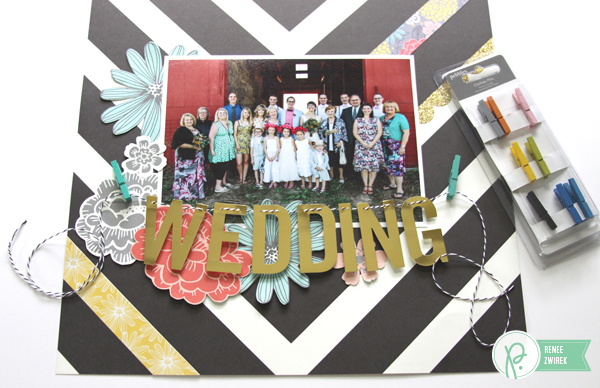 Thanks so much for the opportunity to join you today and I hope I inspired you to create!You can find a layout I created from the Home+Made collection on my blog, my FB page, my Pinterest page, and my Instagram profile.